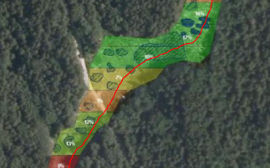 Use PSP-IFSAR method for monitoring the sites of interest, allowing the measurement of differential deformation of the ground and each single structure, with millimetric/centimetric accuracy. 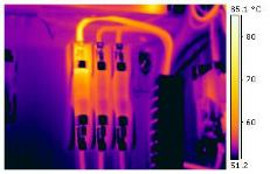 Integration of the PSP results with high resolution optical images by RPASs for improving the existing models in the field of Structural Health Monitoring (SHM). Investigation of pre-screening method to be used for identification of clusters of PS, characterized by potential interest. Detailed analysis (large scale) of the more critical clusters by optical data. 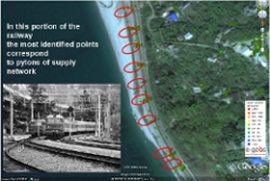 Possible to measure terrain displacements in correspondence of thousands of PS points per km2 over the railway infrastructure and their surroundings. Monitoring of already known and identification of new phenomena. 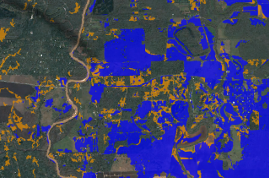 Detailed reconstruction of the territory, through a high resolution Digital Surface Model (DSM), to estimate the risk of flood as soon as the water extent exceeds a certain threshold. Continuous and automatic monitoring of water extent of rivers, derived from optical and SAR satellite data. 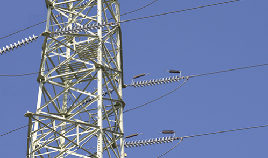 Cost saving monitoring is fully based on Sentinel images (open data). Timely alert of potential flood. 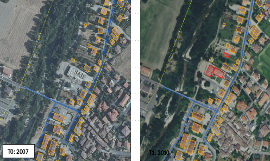 Exposure analysis based on the knowledge of the areas potentially impacted by a flood. Consequences analysis based on the knowledge of the flooded areas in case of event. Preliminary map of vegetation of the corridor of interest in order to classify the AOI in terms of risks. 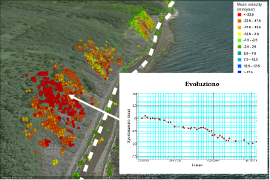 2D and 3D change detection analysis to estimate the entity (surface, density and height) of vegetation growing . Cost reduction, as no personnel walking along the line or on helicopters. Reducing risks to personnel no need for personnel to stay close to the line. 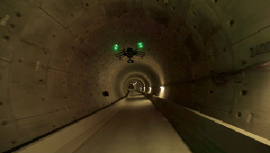 Use RPAS for close-distance inspection of key elements of infrastructure to identify high temperature points and places where a corona discharge occurs. Time saving - quick surveys, no need to disrupt train schedules. High resolution of acquired data. 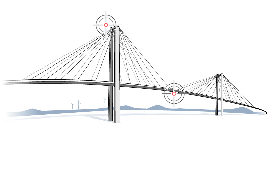 Survey critical parts of the bridges, galleries and buildings looking for structural damages. Possibility of constructing a 3D model from acquire data. Ability to perform 3D measurements on the model. Preliminary detailed mapping of the AOI, in terms of buildings, infrastructure, vegetation, transport network, etc., based on VHR optical satellite data. Processing of fresh optical or radar satellite data, to detect and classify any change that could represent a potential encroachment. Eliminating risks to personnel no need for personnel to stay close to the line.